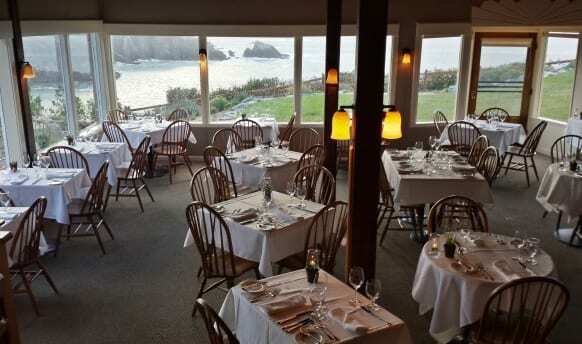 While planning a trip to the Mendocino coast last summer, a friend told me not to miss dinner at the Albion River Inn. 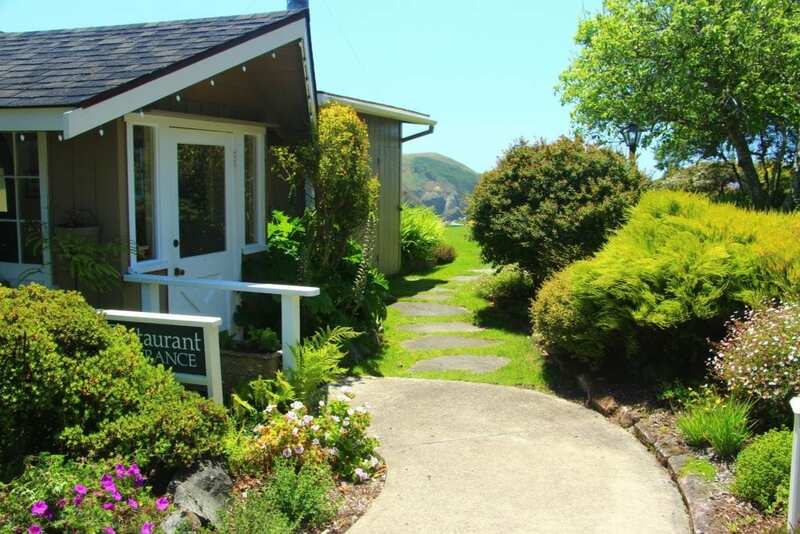 The restaurant is tucked inside an unassuming building among a collection of cottages off Highway One. But upon entering, the dining room opens to a panoramic vista of grassy headlands, rocky islets, and a protected cove where the Albion River flows languidly into the sea. 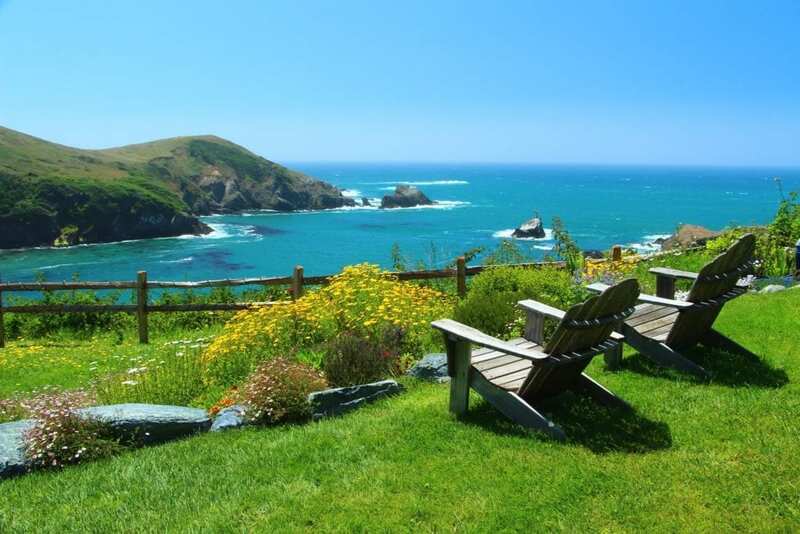 A pair of Adirondack chairs just outside on the lawn beckon you to nestle in with a glass of wine to enjoy the view and the garden blooms sweeping the edge of the bluff. Inside, the dining room is suffused in a warm glow lit by tiny, flickering oil lamps, amber-tinted sconces, and the setting sun. Petite bouquets of flowers adorn the white tablecloth-draped tables and look as if they could have been freshly plucked from the surrounding gardens. A soft piano floats above the hushed whispers of the other guests. The serene setting is enchanting, utterly romantic, and only rivaled by the impeccable service, the wine and spirits, and the food. The James Beard award-winning chef Stephen Smith has been at the helm of Albion River Inn’s kitchen for over 20 years. He draws the inspiration for his cuisine from the sea, Mendocino’s seasonal organic produce, and local ranchers and purveyors. The back wall of the dining room is filled edge to edge with an assortment of framed awards and accolades beginning from the restaurant’s earliest years. Albion River Inn was a recipient of Wine Spectators’ “Award of Excellence” for 19 consecutive years until recently, when someone simply forgot to submit the application. Not that Albion River Inn really needs another plaque on the wall. The reputation of their long-standing sommelier easily suffices. Mark Bowery has directed the restaurant’s wine and spirits program since 1989, curating the most extensive wine list on the Mendocino coast. The ever-changing list offers over 550 labels from around the world. 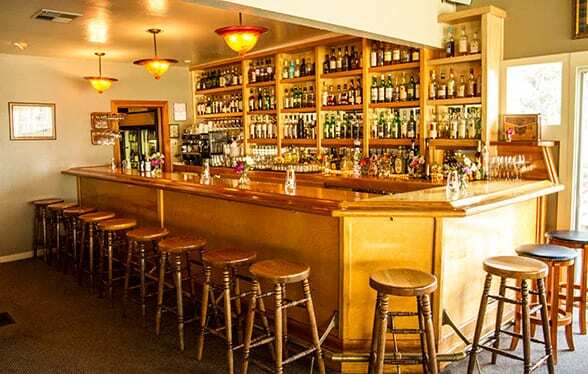 In addition to the wines, Mark has also assembled an impressive collection of hundreds of spirits, including over 150 single-malt whiskies from Scotland. You can order a tasting flight of single malts to sample some of Mark’s favorite Scotches. The bar is tended by Laura Spradlin, who, like the chef and sommelier, has also been with the inn for over 20 years. She’s a favorite among locals and travelers alike for her hand-crafted cocktails. Drop in between 5 and 6 p.m. to mingle with the local crowd and enjoy happy hour discounts on house wines, beer and well drinks. The night I was there, I ordered a glass of wine and the chef’s choice three-course menu, which started with a tossed greens salad. The salad featured a great mix of textures–tender roasted beets, toasted pumpkin seeds, and crispy fried leeks–tossed with a tangy mango-rice wine vinaigrette. The main course was a pan-seared local ling cod. The filet was perfectly prepared and served on a bed of coconut Jasmine rice with a delicious but surprisingly delicate mango-jalapeno cream sauce. The fish was topped with marinated cherry tomatoes, sliced avocado, and a lively mango relish with lime, red onion, and cilantro. The presentation was beautiful and bursting with color. 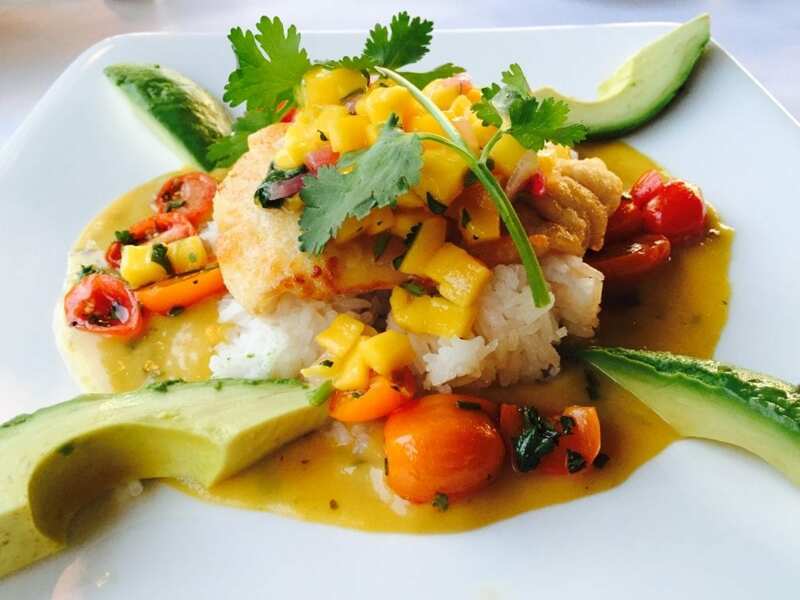 The combination of tropical flavors and local ingredients paired wonderfully for a coastal summer dish. The finale was a decadent, semi-sweet chocolate mousse flavored with brandy, Kahlua, amaretto and hazelnut liquors. The satisfyingly rich mousse was served with freshly whipped cream, fresh strawberries, and fresh mint. I dipped my spoon into the tall glass of chocolate bliss just as the sun began dipping below the ocean. Pink and purple clouds drifted across a pale orange sky and a faint, ragged edge of a fog bank appeared on the horizon. Guests at the other tables began murmuring their compliments to the chef and then gathering themselves to leave. Slowly, spoon by spoon, I tried to make my chocolate mousse and the sunset last as long as possible. While dinner at the Albion River Inn should not to be missed, neither should an overnight stay at the inn. 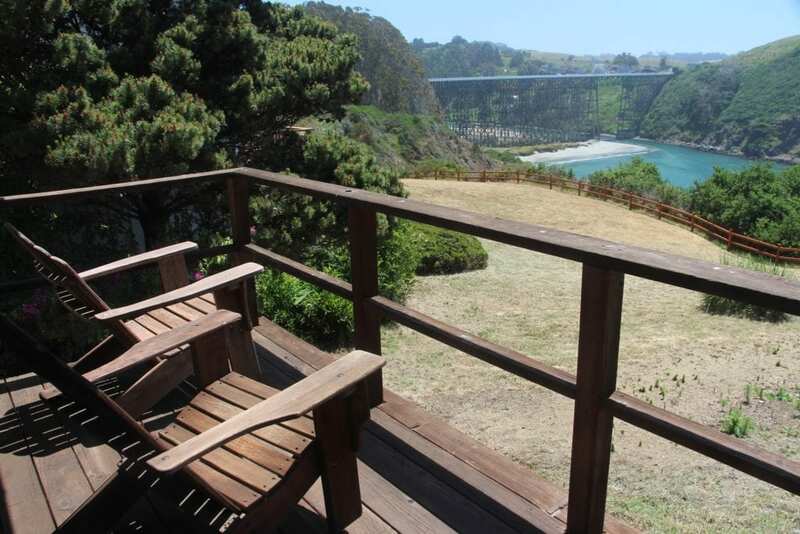 The inn features 22 cottage guest rooms lining the bluff, all with the same mesmerizing views as the restaurant. Most of the rooms are quite spacious with wide, sliding glass doors that open to private decks and Adirondack chairs for enjoying the views of the quiet cove and the wooden trestle bridge spanning the river. Inside, nearly all of the rooms have wood or gas burning fireplaces with leather armchairs for cozying up to the fire. A number of the rooms also feature jetted spa tubs with stunning views or large soaking tubs for two. There are no televisions, so it’s an ideal place for reading, enjoying the views, and catching up on some serious rest and relaxation. 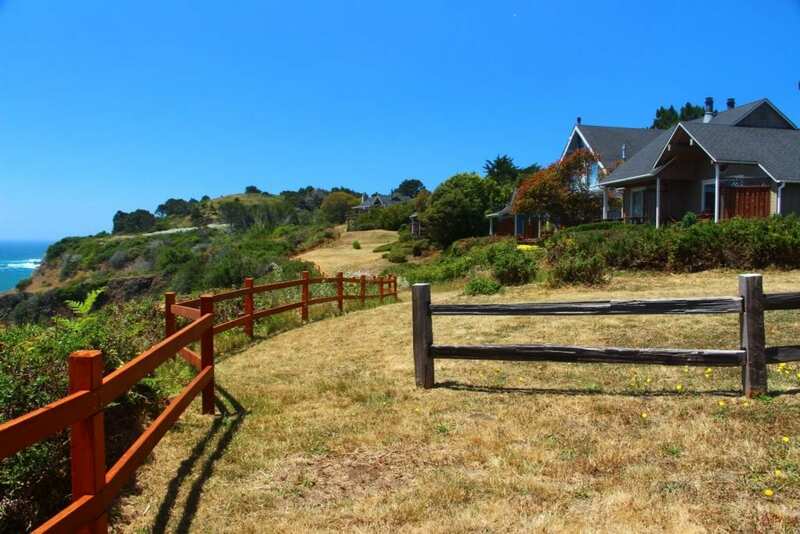 The shops and galleries in Mendocino Village are just seven miles north on Highway One. Wine tasting in the Andersen Valley is a short drive away through the redwoods along Highway 128. At nearby Van Damme State Park, guests can hike through a fern-carpeted redwood canyon or take a guided sea cave kayaking tour. Guests to the Albion River Inn are welcomed with a split of wine and treated to an exclusive breakfast in the restaurant each morning. Rates start at $195 for a basic room with a view. The third and fourth photos courtesy of Albion River Inn. All others by Ranee Ruble-Dotts for CABBI.